← The first kumibo tournament of the Okinawa Traditional Kobudo Association was held February, 2011. Budōka (tōdī and kobujutsu), Official of the royal government (in the rank of an Ufuchiku), Second Hand Dealer. Yoshimura Chogi, who studied together with his brother and Ufuchiku under his father Yoshimura Udun. Kinjō was born in the community of Tōbaru village in Shuri, the present Naha-shi Shuri Tōbaru-chō. He was called Kinjō Ufuchiku (nickname Kanī-usumē) and was famous as a master of saijutsu. Ufuchiku was an official title under the royal government, equivalent to today’s police commissioner. Among his students were Gibo Kamado and Gusukuma Riō, splendid fellows who ran up the ascending slope to Shuri ran in iron clogs. 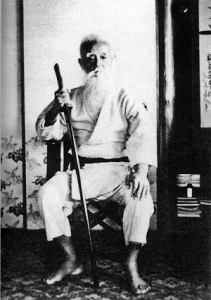 Furthermore there were Kinjō Shinkō (born 1877) and Tokashiki Sanda (Saburō). It was Yabiku Mōden who received special training from Kinjō. Furthermore there was Kina Shōsei, who in turn was the teacher of Kyan Shin’ei. Kina Shōsei originally came from Higa in Nakagusuku-son. He visited Kinjō at his home in Shuri Gibo in the year 1907, where he learned the fundamentals of saijutsu. 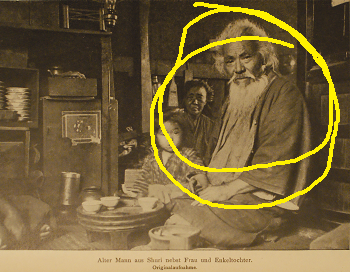 At that time, Kinjō was already about 74 or 75 years old and made his living as second-hand goods dealer. Within the abolition of the feudal system and establishment of prefectures (1874-79) the Royal Government of Ryūkyū was abolished and thus Ufuchiku also lost his job. For this reason, Kinjō struggled to earn a living. Kina Shōsei was Kinjō’s last student. Around the age of twenty years he visited him and asked to be allowed to become a student. This was first of all rejected. After Kina asked for admission another two or three times, he finally received approval. And then, within an intensive study of 5 years, Ufuchiku initiated him into the secret lore of the techniques of karatejutsu, saijutsu. These were the favorite words of Ufuchiku. Precisely because Kinjō Ufuchiku made this morality of the martial virtues clear in a rigorous and strict way, he is a pioneer of kobujutsu. The picture showing the person having been identified as Kanagusuku, in the Ryūkyū Shinpō of November 26th, 1961. 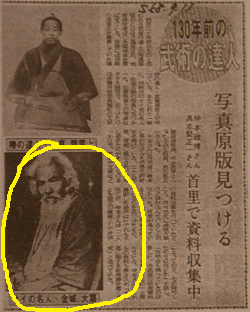 The title reads: “Master of Bujutsu 130 years ago: Original photography discovered in the data collection in Shuri.” By Nakamoto Masahiro, Gushiken Shōichi. During the era of kings Shō Iku and Shō Tai he traveled as a royal bodyguard to Edo (Tōkyō). One of the gifts presented to the imperial family on this occasion was an Okinawan horse (pony). Since the winter of 1374, when King Satto sent his tribute manager Taiki to Ming-China, horses and sulfur where given to the Ming emperor as tribute. The horses were small-sized and white spotted and came from Miyako and Yonaguni. They were called Kōjā nu Ma-gwa. When Kinjō Ufuchiku traveled to Edo, such a white spotted horse was the gift to the imperial family. It has been told that when during the voyage the horse would refuse to eat his food, Kinjō Ufuchiku would also refused to eat. This shows a lot of compassion for the animals. While in Edo, every morning Kinjō Ufuchiku struck against a makiwara he had erected on the edge of the well, carried heavy stones through the water, and trained his entire body. Although he did not drink alcohol he would solemnly raise his mug with both hands for toasting, to congratulate and at festivals. Such well-mannered he was. Although he did not drink alcohol, he liked tea instead. His meals quite simple and consisted mainly of vegetables, particularly potatoes and the leaves of sweet potato (kandabā) were his favorite dish. “After I’m dead, and the time of the bone washing has come, examine my hip bone”. The original photo was taken by Simon and published in his PhD thesis in Leipzig, Germany 1913. This she did and it turned out that Ufuchiku’s hip bone was still of great strength, that is, the individual bones had not fallen apart, but still held together. While the hip bone of an average person detaches, the hip bone of stronger person as a result of the training will remain strong and firm. This was the result of daily training in karate and kobujutsu, which still reveals itself even after death. Ufuchiku enjoyed cordial trust and popularity and intended to influence many young men by teaching them kobudō. He passed away October 13, 1916, at the age of 82 years. This entry was posted in Unknown Ryukyu and tagged Kaniusume, Kina Shosei, Kinjo Ufuchiku, Saijutsu, Shosei Kina, Ufuchiku, Ufuchiku Kobujutsu. Bookmark the permalink.